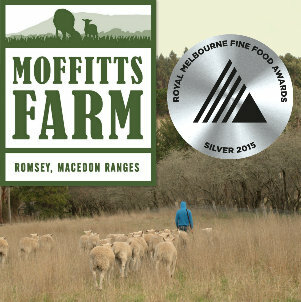 Moffitts Farm first thunderstorm rain for the summer happened over 36 hours on 26 to 28 February. A total of 67 mm fell in two torrential downpours. Prior to this fall summer rain totaled 15 mm in December, 2 mm in January and 16 mm in February. Coupled with record high temperature and 30th percentile spring rainfall, this was the driest summer we had experienced. There was no runoff from the thunderstorms as pasture dry matter cover was moderate to high at 3000 to 5000 kg dry matter per ha. 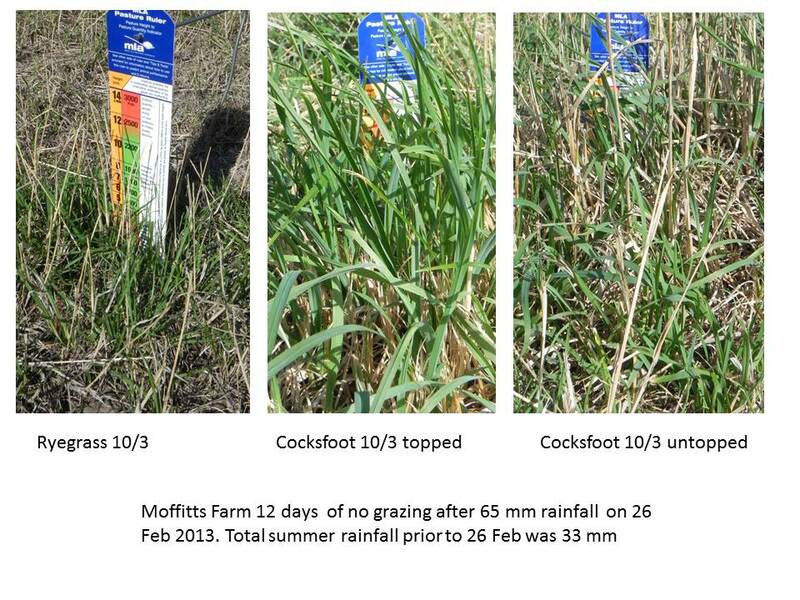 Response to the rainfall was dramatic with the summer active cocksfoot and tall fescue sending up 20 cm plus leaves from multiple tillers within 11 days. 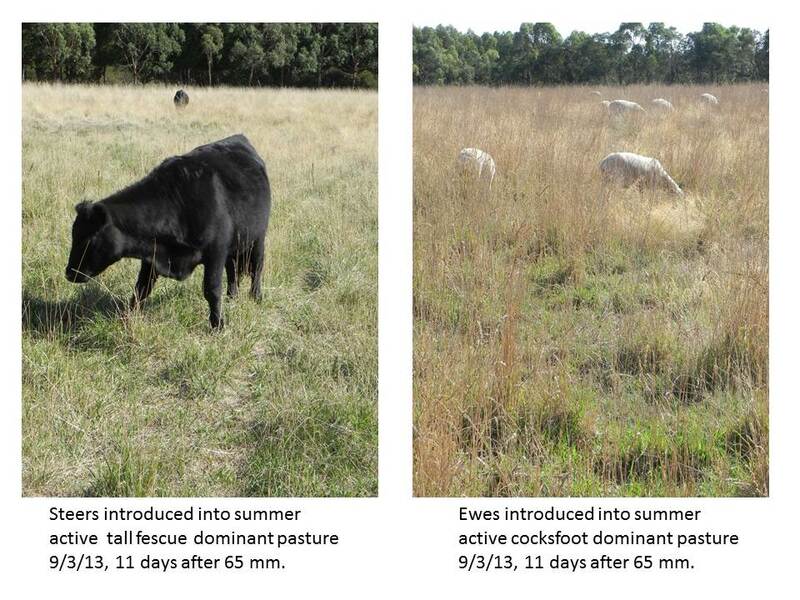 Response to the rainfall was dramatic with the summer active cocksfoot (left) and tall fescue growing 20 cm plus leaves from multiple tillers within 11 days. Given some pastures had particularly long dry stems, the rainfall gave me an opportunity to try pasture topping with a slasher (it was too dangerous to use a slasher in the tinder dry pastures prior to the rain). The idea is to cut the thick tall stems off without damaging the crown; to do this the slasher operated about 25 – 35 cm off the soil surface. As the images below shows, when the dry stems are not particularly thick, this strategy is not worthwhile as far as green leaf growth is concerned. But in some paddocks where stem dry matter was extreme, topping will hasten the decomposition process of the stalks, which would otherwise oxidise in the air or be eventually trampled onto the ground by livestock (this usually takes to the following spring on Moffitts Farm). * This is not a brittle grassland environement and there is already close to 100% ground cover comprising plant crowns and plant organic matter. There is no surface crust to disturb or break up. * The high stock density required to acheive the effect may in this environment either cause significant soil compaction, or surface pugging depending on rainfall prior to and during the high impact strategy. * There is a risk that with plant damage during the strategy and no-rain after it that perennial plants could be slow to recover once rain occurs. 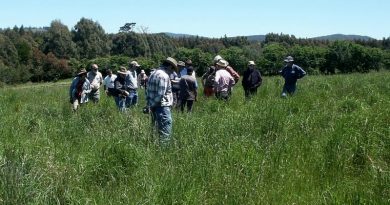 Spring 2012 was a classic example of this risk event, pasture growth was strong in early spring after excellent winter rainfall. But spring rain failed as did summer rain. 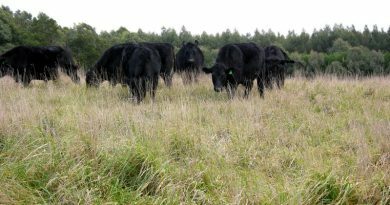 * There is a risk from a high intensity rainfall event, causing top soil, organic matter and livestock manure erosion if it occurs during or soon after a high impact grazing strategy. * Standing feed, even if dry, is always a substrate for each animal’s rumen microorganisms to breakdown. They can be assisted in their job with nitrogren sources in licks. In comparison bare paddocks have little dry matter on offer so livestock need fodder provided. 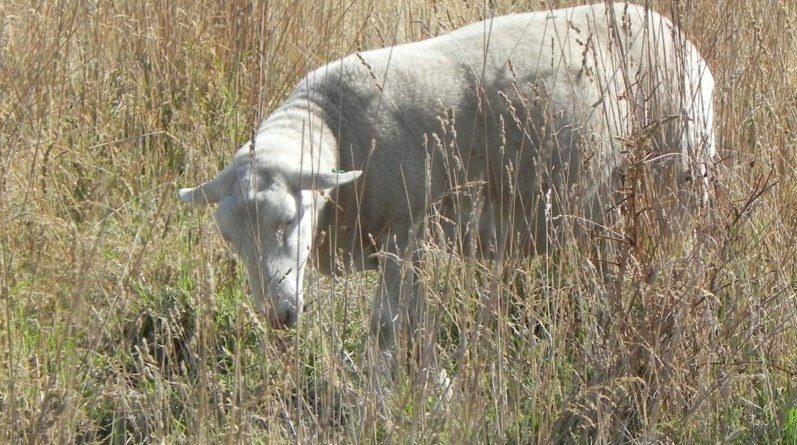 * There could be some animal health issues with this strategy especially with internal worms when animals are forced to graze a quickly decreasing and soiled plant matter. * For me there is an ethical factor involved relating to animal welfare. While Allan Savory says the strategy mimics the wild herd migration on southern Africa’s grasslands, artifically mimicing this natural process with livestock confined by electric fences could unintentionally be abused. In super high stocking density regimes there is very little margin for error as unlike the wild herds, the livestock have no fresh pasture to move onto until a person intervenes.